Languages Deep Speech, Telepathy 120 ft.
Amphibious. The aboleth can breathe air and water. Mucous Cloud. While underwater, the aboleth is surrounded by transformative mucus. A creature that touches the aboleth or that hits it with a melee attack while within 5 feet of it must make a DC 14 Constitution saving throw. On a failure, the creature is diseased for 1d4 hours. The diseased creature can breathe only underwater. Probing Telepathy. If a creature communicates telepathically with the aboleth, the aboleth learns the creature's greatest desires if the aboleth can see the creature. Multiattack. The aboleth makes three tentacle attacks. Tentacle. Melee Weapon Attack: +9 to hit, reach 10 ft., one target. Hit: 12 (2d6 + 5) bludgeoning damage. If the target is a creature, it must succeed on a DC 14 Constitution saving throw or become diseased. The disease has no effect for 1 minute and can be removed by any magic that cures disease. After 1 minute, the diseased creature's skin becomes translucent and slimy, the creature can't regain hit points unless it is underwater, and the disease can be removed only by heal or another disease-curing spell of 6th level or higher. When the creature is outside a body of water, it takes 6 (1d12) acid damage every 10 minutes unless moisture is applied to the skin before 10 minutes have passed. Tail. Melee Weapon Attack: +9 to hit, reach 10 ft. one target. Hit: 15 (3d6 + 5) bludgeoning damage. Enslave (3/Day). The aboleth targets one creature it can see within 30 feet of it. The target must succeed on a DC 14 Wisdom saving throw or be magically charmed by the aboleth until the aboleth dies or until it is on a different plane of existence from the target. The charmed target is under the aboleth's control and can't take reactions, and the aboleth and the target can communicate telepathically with each other over any distance. Whenever the charmed target takes damage, the target can repeat the saving throw. On a success, the effect ends. No more than once every 24 hours, the target can also repeat the saving throw when it is at least 1 mile away from the aboleth. The aboleth can take 3 legendary actions, choosing from the options below. Only one legendary action option can be used at a time and only at the end of another creature's turn. The aboleth regains spent legendary actions at the start of its turn. Detect. The aboleth makes a Wisdom (Perception) check. Tail Swipe. The aboleth makes one tail attack. Psychic Drain (Costs 2 Actions). One creature charmed by the aboleth takes 10 (3d6) psychic damage, and the aboleth regains hit points equal to the damage the creature takes. Aboleths lair in subterranean lakes or the rocky depths of the ocean, often surrounded by the ruins of an ancient, fallen aboleth city. 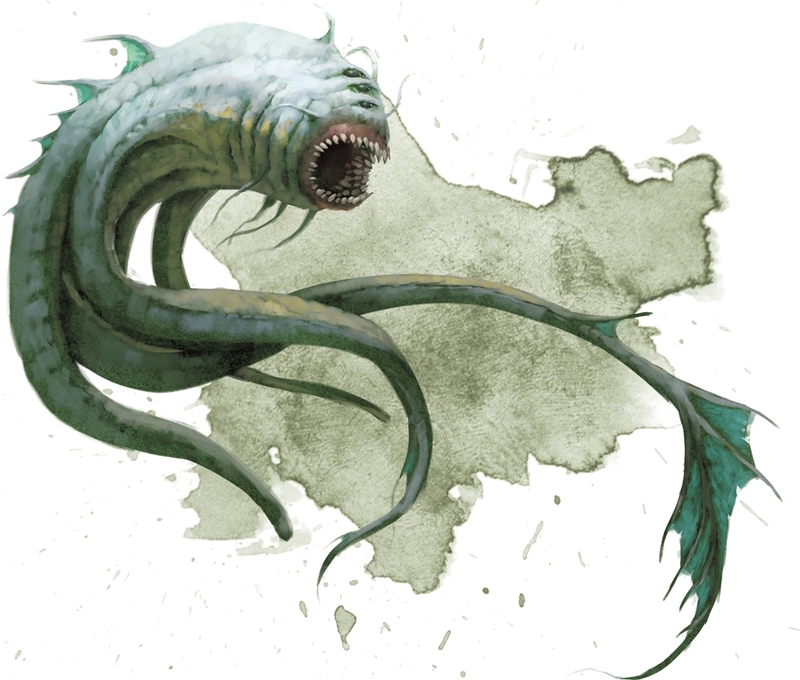 An aboleth spends most of its existence underwater, surfacing occasionally to treat with visitors or deranged worshipers. The aboleth casts phantasmal force (no components required) on any number of creatures it can see within 60 feet of it. While maintaining concentration on this effect, the aboleth can’t take other lair actions. If a target succeeds on the saving throw or if the effect ends for it, the target is immune to the aboleth’s phantasmal force lair action for the next 24 hours, although such a creature can choose to be affected. Pools of water within 90 feet of the aboleth surge outward in a grasping tide. Any creature on the ground within 20 feet of such a pool must succeed on a DC 14 Strength saving throw or be pulled up to 20 feet into the water and knocked prone. The aboleth can’t use this lair action again until it has used a different one. Water in the aboleth’s lair magically becomes a conduit for the creature’s rage. The aboleth can target any number of creatures it can see in such water within 90 feet of it. A target must succeed on a DC 14 Wisdom saving throw or take 7 (2d6) psychic damage. The aboleth can’t use this lair action again until it has used a different one. Underground surfaces within 1 mile of the aboleth’s lair are slimy and wet and are difficult terrain. Water sources within 1 mile of the lair are supernaturally fouled. Enemies of the aboleth that drink such water vomit it within minutes. As an action, the aboleth can create an illusory image of itself within 1 mile of the lair. The copy can appear at any location the aboleth has seen before or in any location a creature charmed by the aboleth can currently see. Once created, the image lasts for as long as the aboleth maintains concentration, as if concentrating on a spell. Although the image is intangible, it looks, sounds, and can move like the aboleth. The aboleth can sense, speak, and use telepathy from the image’s position as if present at that position. If the image takes any damage, it disappears. If the aboleth dies, the first two effects fade over the course of 3d10 days. man, it could be useful if you are playing a campaign that has lots of water! I wish there was more info on aboleths, they are my favorite dnd monsters. It would be great if they were given the same treatment as the yuan-ti/ illithds/ giants/ gnolls/ beholders/ hags/ goblinoinds/ kobolds/ orcs were in volo's guide, or the Gith/ Elves/ Demons/ Devils/ Dwarves/ Halflings/ Gnomes were in Mordenkainen's tome of foes. Check out this book from 3rd Edition! It has some great material on the Aboleth more in line with Volo's or Mordenkainen. Sure thing! The Aboleth are also the big bads in my current Tier-2 campaign and I found this 3rd-edition info to be quite helpful. It's an Underdark dweller though. If it's in an ordinary ocean it'd be deeeeeep down there. Does anybody have an opinion on the psychic drain effect not triggering the repeat of the saving throw? I know that it's not much, but looking at the stats, you'd only get to use that feature around 3 times in a fight, and the idea of the creature being enslaved AND used as a mechanism to heal the bad guy continually seems really frightening to me...which I kind of think is the idea of an aboleth. I'm admittedly saying I don't know if it would be game breaking--just wondering opinions on whether or not it seems like a good idea. What does it mean by inititaive count 20? Does it mean the 20th turn or something else? Whenever PCs and monsters roll for initiative, lair actions happen between things that rolled a 21 for initiative and things that rolled a 19 for initiative. It goes after things that rolled a 20. Hope that helps! i think it's fine- the damage causes a saving throw to break the charm, so it's a bit of a risk on the Aboleth's part as well. I was rather surprised that there was no descriptive paragraph of Aboleths. I own the physical copy of the Monster Manual and that had a descriptive paragraph so I wondered why there wasn't one here since it came with the Basic Rules. But the descriptive paragraph is still there, but you have to buy the Monster Manual for the site in order to see it.